You’re more likely to find someone sporting 19th-century goggles, a bustier, a pocket watch, and a machine arm while riding a skeletal, steam-powered tractor in Atlanta than you are in any other U.S. city. Movoto, a real estate site, recently crunched data on various metros to determine we deserved the steampunk superlative. For the masses unaware of the sci-fi genre, it fetishizes steam power, Victorian aesthetics, and inventions. It’s the Wild West mashed up with robotics, as seen through a punk lens. Kind of like Mad Max. How’d we score the top spot for steam enthusiasts? We shouldn’t be too surprised since we also ranked as Movoto’s nerdiest city thanks in part to Georgia Techies, and our history as a railroad hub probably didn’t hurt. However, our plentiful antique shops and conventions won over Movoto. In truth, though, this award belongs to DragonCon. 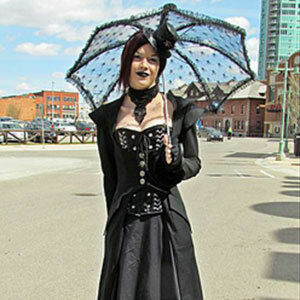 After all, the convention almost won the Guinness World Record for Largest Gathering of Steampunks.